Cation exchange materials react only with positively charged ions such as Ca++ and Mh++. The older method of intermittent softening consists of mixing the chemicals with the water in a tank, allowing time for reaction and settling of the sludge, and drawing off the clear water. Continuous draw-off of softened water. Lime-soda softening may also be classified as hot or cold, depending on the temperature of the water. 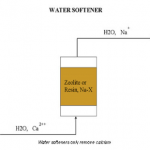 Hot process softeners increase the rate of chemical reactions and give better quality water. The main advantage of zeolite softening is ease of control. Running this system does not require any training nor does it require a staff person to take care of it. When paired with bulk brine tank, system can run 100% automatically. Ordinary variations of hardness in the raw water or in flow rate do not affect completeness of softening. The use of acid exchangers has advantages when a low alkalinity soft water is required. Better quality water than can be obtained by any other method. It has compact size and small footprint. The chemicals used (salt) are safer for the operator to handle and operation is much easier. The main advantage is that in reducing hardness, alkalinity and silica can also be reduced. In addition, prior clarification of the water is not usually necessary since suspended matter and turbidity are also removed in the process. Another advantage is that with continuous hot process softening some removal of oxygen and carbon dioxide can be achieved. Operational costs may be lower than ion softening. However, careful analysis needs to be done to consider the costs of full time staff to run equipment. Could have higher operating costs. The total solids, alkalinity and silica contents of the raw water are not reduced. A problem encountered with cation exchange on the hydrogen cycle is corrosion from acidity of the effluent. This does not apply for standard sodium exchange softeners. In some cases, fouling of the ion exchange material with suspended or colloidal matter in the raw water can produce difficulties and some water impurities cause degradation of the material. Softeners have to be backwashed in a manner similar to a filter, and the recharge water, known as brine, could cause disposal problems. Initial capital cost is higher. Hardness is reduced it is not completely removed. Wide variations in raw water composition and flow rate also make control of this method difficult since this involves adjusting the amounts of lime and soda ash being fed. When minerals dissolve in water they form electrically charged particles called ions. Calcium carbonate, for example, forms a calcium ion with plus charges (a cation) and a carbonate ion with negative charges (an anion). Certain natural and synthetic materials have the ability to remove mineral ions from water in exchange for others. For example, in passing water through a simple cation exchange softener all of calcium and magnesium ions are removed and replaced with sodium ions. Ion exchange materials usually are provided in the form of small beads or crystals which compose a bed several feet deep through which the water is passed. Ion exchange materials are basically of two types: cation and anion exchangers. Anion exchanger materials react only with the negatively charged ions such as carbonate (CO3-) and sulphate (SO4-). Zeolite materials are cation exchangers composed chiefly of sodium, aluminum and silica. There are several other types of cation exchange materials of an organic or resinous nature. The anion materials are usually organic in nature and are of two basic types: weak base and strong base types. Weak base exchangers don’t take out carbon dioxide or silica (actually carbonic acid and silica acid) but remove strong acid anions by a process that is more like adsorption than ion exchange. Strong base anion exchangers on the other hand can reduce silica and carbon dioxide to very low values. Cation exchangers usually poles which settle out readily. In these cases clarification equipment merely involves the use of settling basins use either a sodium or hydrogen cycle. That is, they may be designed to replace all cations in the water with either sodium or hydrogen. Strong base anion exchangers are generally operated on a hydroxide weak base on a carbonate cycle. Chloride anion exchange is also used in some processes. Just as coagulants are used for removing suspended matter in clarification processes, they serve to clump together precipitates in the softening process. Coagulants can speed up settling of sludge as much as 25 – 50 per cent. Sodium aluminate has a special advantage as a coagulant in lime-soda softening since unlike most other coagulants it is alkaline and also contributes to the softening reactions’, particularly in reducing magnesium. Effective use of coagulants helps remove silica in the softening process. Silica tends to be absorbed in the floc produced by coagulation of sludge. Compared with lime-soda ash softening, ion-exchange has certain advantages. It is compact and has a low capital cost. The chemicals used are safer for the operator to handle and operation is much easier. The ion exchange process is more cost-effective when treating ground waters, as they are typically a non-carbonate form of water hardness. Do you need more information about equipment sizing, leasing or financing? Contact us today using the buttons below.